・ Entries must be a lady scarecrow . Perhaps one famous in history such as a Suffragette. ・ Props may be used with the scarecrow. ・ Scarecrows must include some plant material which can be living, fresh or dried. ・ They should be no taller than 1.8m tall and be able to withstand all weather conditions. ・ The use of recycled materials is encouraged. 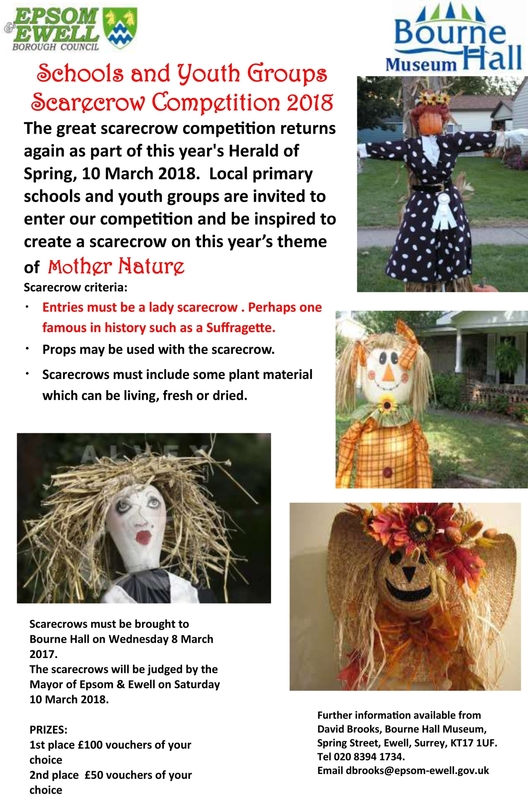 Scarecrows must be brought to Bourne Hall on Wednesday 8 March 2017. The scarecrows will be judged by the Mayor of Epsom & Ewell on Saturday 10 March 2018. Further information available from David Brooks, Bourne Hall Museum, Spring Street, Ewell, Surrey, KT17 1UF. Tel 020 8394 1734.